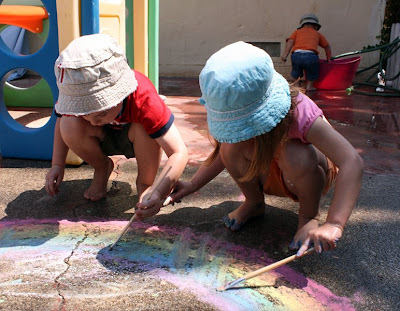 I definitely need to do some chalk and water painting with my kids, they'll love it! 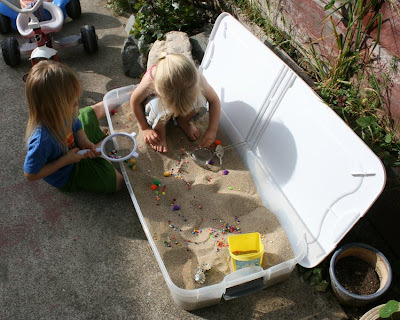 So glad your kids like the sand pit, I'll have to add a second storage box to use as a kiddie pool in our yard! Great projects! 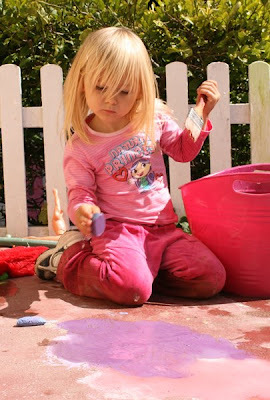 Love the sandbox, thanks for the link (I subscribe to Thrifty Craft Mama... I must have missed that post on one of those "oh no! I have 368 things in my reader!! better just hit 'read all'" days!) Also, I love your bead/sieve add on! 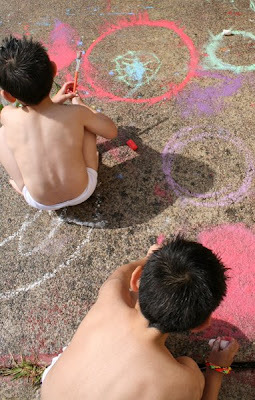 Ooo, I never thought of adding water to chalk! 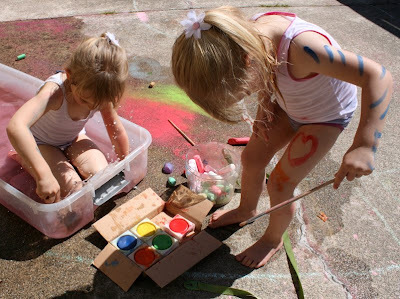 Well, OK, I saw a neighbor do it 2 years ago and became frightened at how messy my then-small kids would get. Must've repressed the memory. 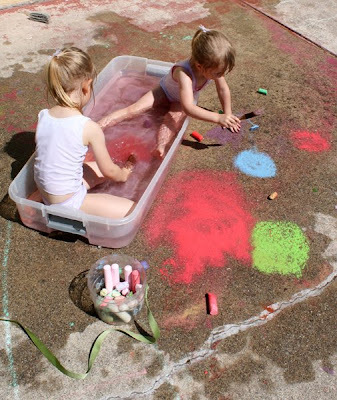 But you know, I think I'm going to do it this summer, especially since the youngest still eats the chalk and gets it all wet anyway. 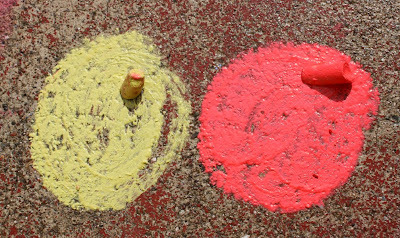 I can see my kids really enjoying mixing colors. 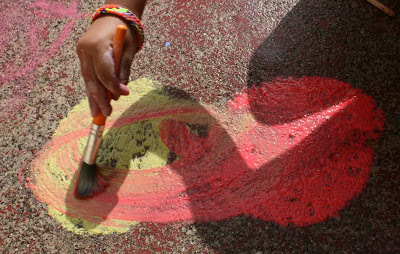 Have I said before how much I like that you're completely unafraid of creative mess? You're inspiring that way (among other ways). Thank you! I have a quick question and hope that you can get back to me. 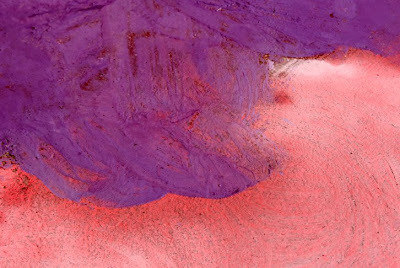 What did you put in the sand? 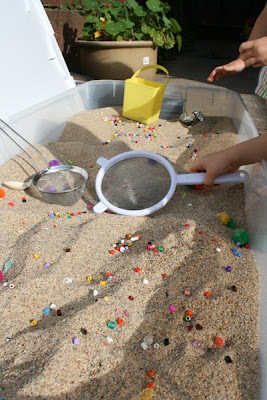 Are those just like little beads and rocks for them to sift threw and find?? This is an amazing idea and would love to do this for my son..
Yep Fall Bride, they are just random beads and pom poms and stuff that I had around the house. I would never have been able to do this last year, because my youngest continued to taste test any small objects until she was nearly two and a half! Choking hazard nightmare. She tried to eat a live snail once! Dear Filth Wizardry Mama, I think I LOVE you! 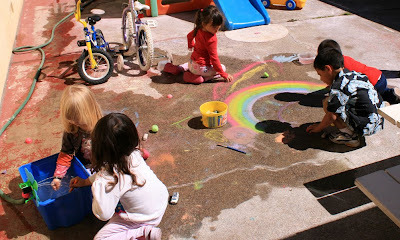 Seriously, I can't begin to tell you how inspired and in awe I am of your exploits with the kiddos. SO. Darn. COOL. 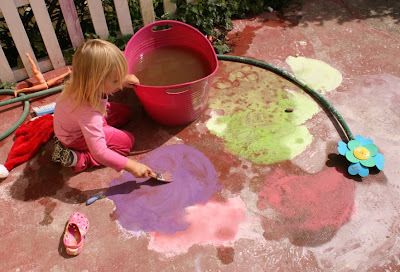 I'm going to co-opt all of your marvelous ideas and start making wonderful messes with my little girl. Thanks so much for sharing, and please, DON'T EVER STOP! A quick question- where did you find those amazing water color blocks? I absolutely love your blog... 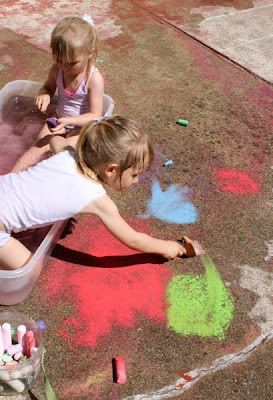 I definitely need to do some chalk and water painting with my kids, they'll love it! Thanks so much for sharing, and please, DON'T EVER STOP! 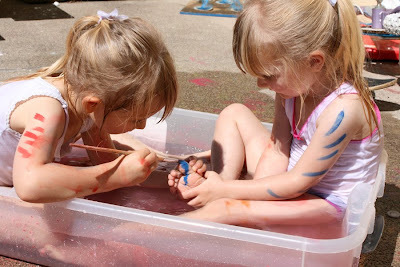 You want to more water painting for kids, just click the link and watch it.